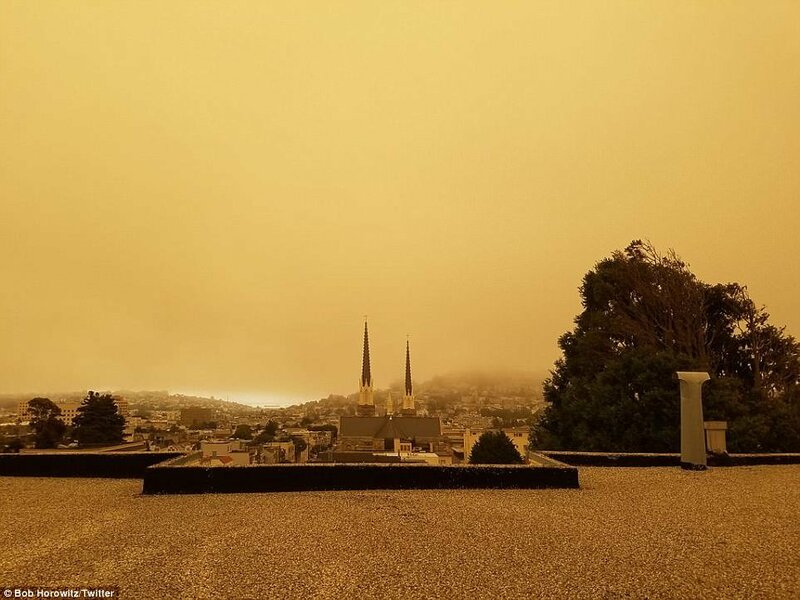 An eerie orange haze covered the San Francisco sky over the weekend as terrifying photos show the raging wildfire spread across Northern California. 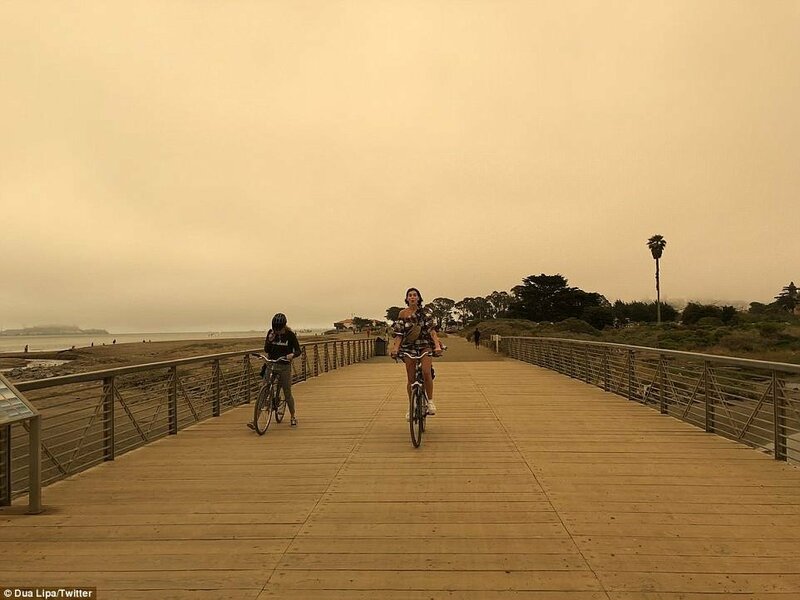 Smoke from the Yolo County fire was contributing to poor air quality in Napa, Sonoma, San Mateo and San Francisco counties. 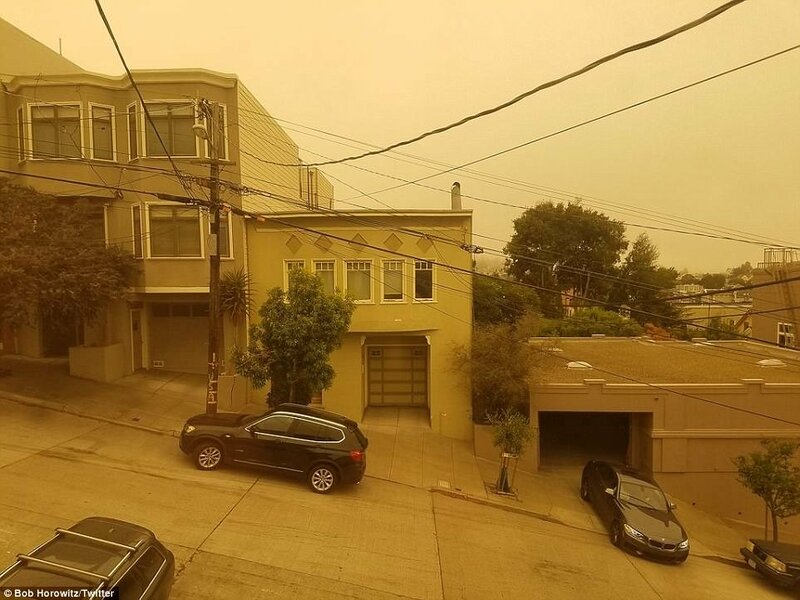 The dusting of ash fell as far away as San Francisco, where tourists snapped pictures of the Golden Gate Bridge enveloped in an orange shroud of fog and smoke. 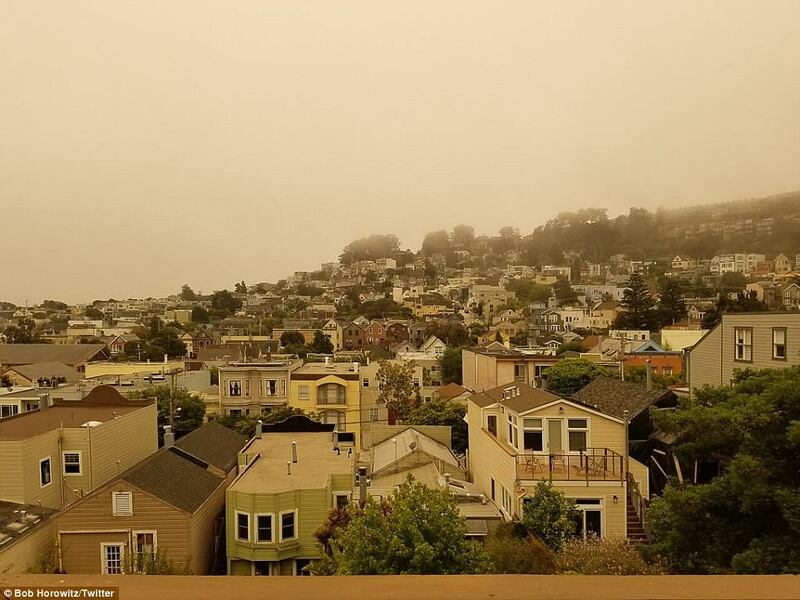 The haze, which also settled on areas to the south and west, rattled nerves near wine country communities that were devastated by deadly wildfires late last year. Hot winds fueling a massive wildfire that prompted evacuations in rural Northern California have pushed the flames into three counties. 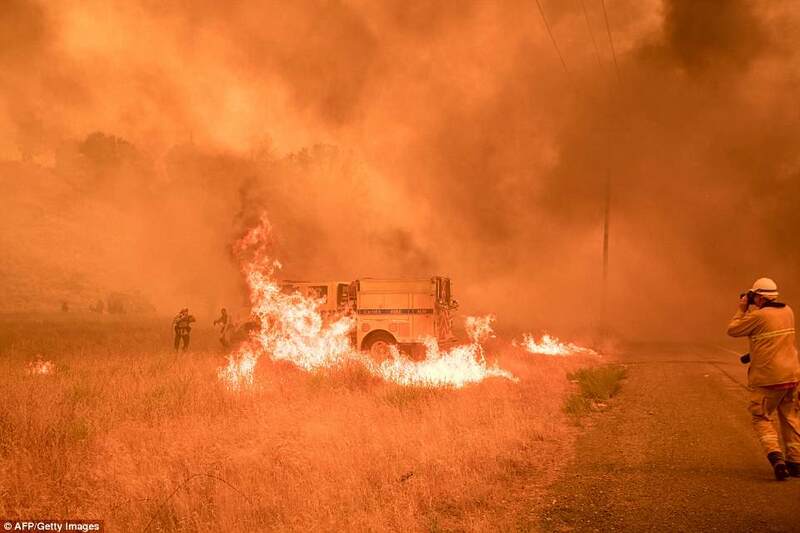 Officials with the California Department of Forestry and Fire Protection said Monday that the blaze that ignited Saturday in western Yolo County spread over the weekend to neighboring Lake and Napa counties. 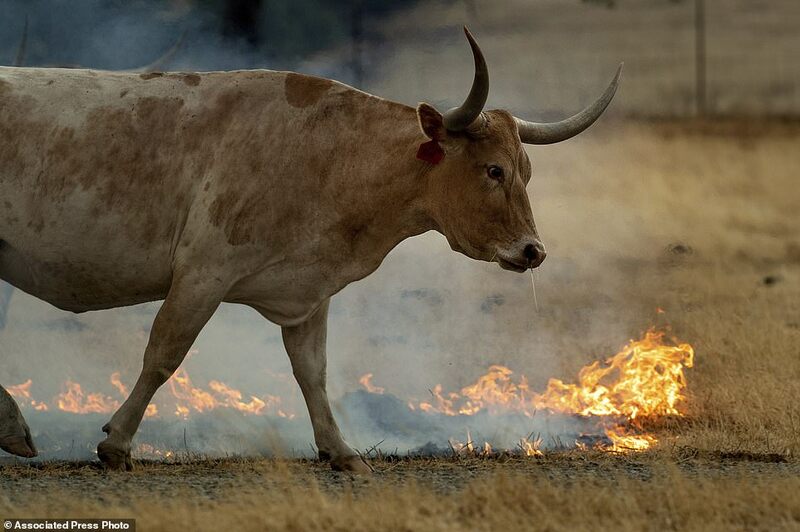 The fast-moving fire has scorched at least 55 square miles of dry brush and threatened more than 100 buildings in ranchland northwest of Sacramento. 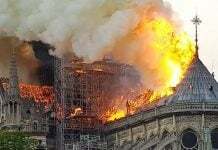 No injuries were reported and the exact number of people evacuated was unclear. 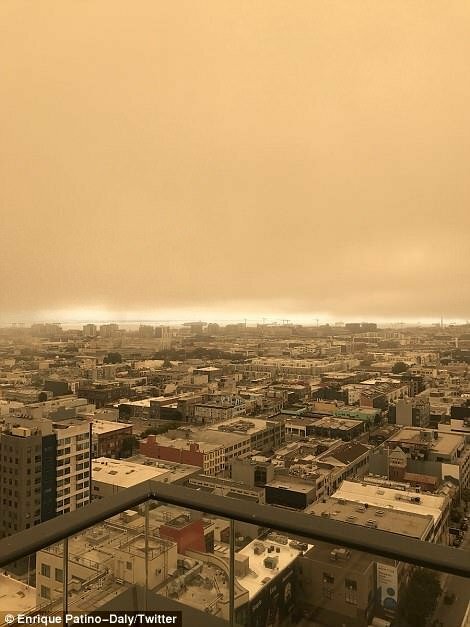 The San Francisco sky was insane today!! This has no filter on it!! 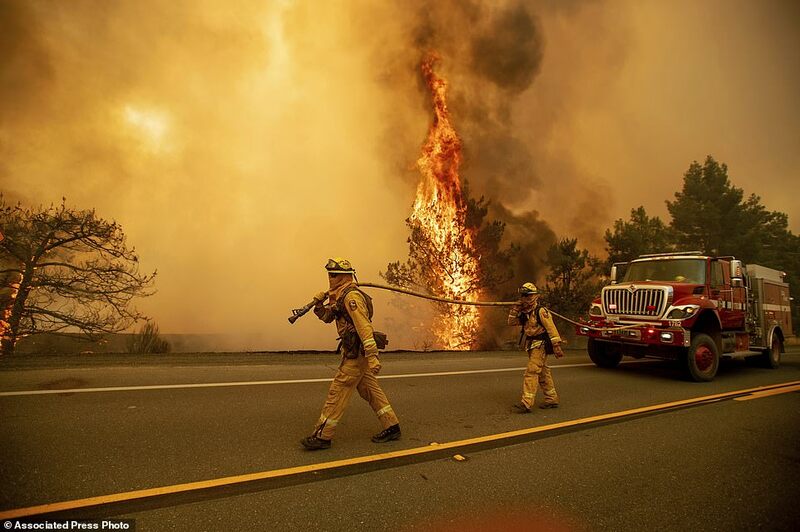 The evacuations were ordered on Sunday as dry, hot winds fueled the out-of-control wildfire. 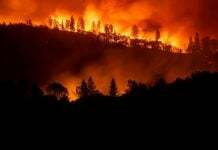 By Sunday night, there was two per cent containment, according to the California Department of Forestry and Fire Protection. 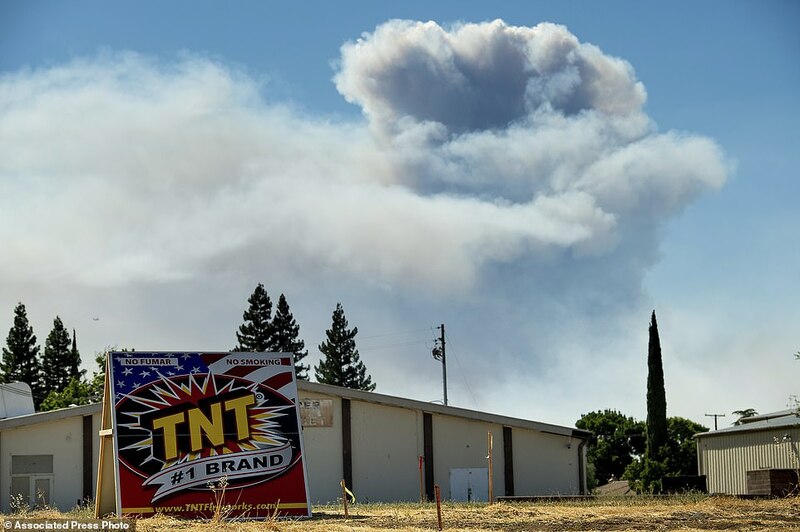 A blaze burning for several days to the west in Lake County jumped containment lines Saturday, prompting additional evacuation orders. That fire was more than 70 per cent contained after charring about 22 square miles of brush and destroying at least 20 structures. 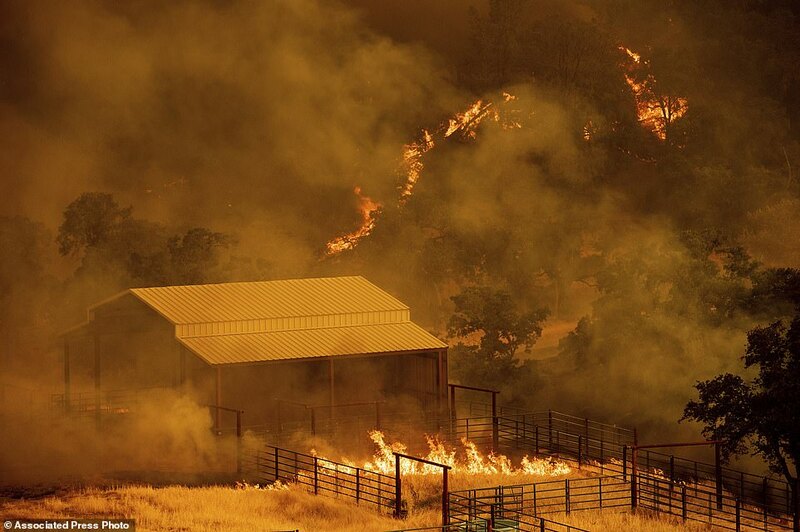 It comes as hot, dry conditions fuel blazes in several Western states. More than 2,500 homes in Colorado are under evacuation orders as firefighters battle more than a half dozen wildfires around the state. 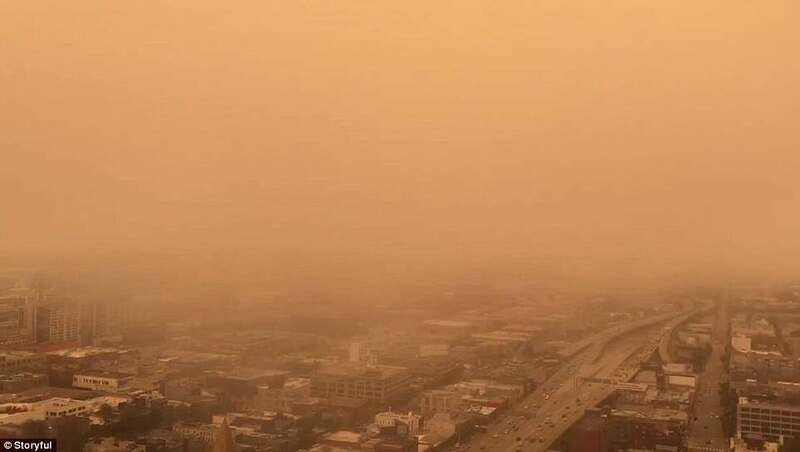 Most of the evacuations in effect Monday were due to a 78-square-mile wildfire in southern Colorado that authorities believe was human-caused. The Costilla County Sheriff’s Office says 52-year-old Jesper Joergensen of Denmark was arrested on arson charges. Investigators haven’t released other details except to say they don’t think he intentionally started the fire. Immigration officials have requested that they be allowed to take custody of him if he’s released from jail. About 570 homes are evacuated near a 2-square-mile fire that started Friday west of Colorado Springs. About 360 children at a camp also had to be evacuated by the Chateau Fire. Firefighters are also trying to contain a wildfire burning in southern Wyoming. About 150 firefighters are battling the fire burning in the Medicine Bow National Forest near the Colorado border. The fire has burned about 33 square miles since it started June 10. 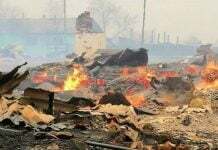 The fire is about 80 per cent contained but it has flared up in the last week, prompting authorities to advise some residents in the area to prepare for evacuation. But all major highways in the area are open Monday. The cause of the fire remains under investigation. 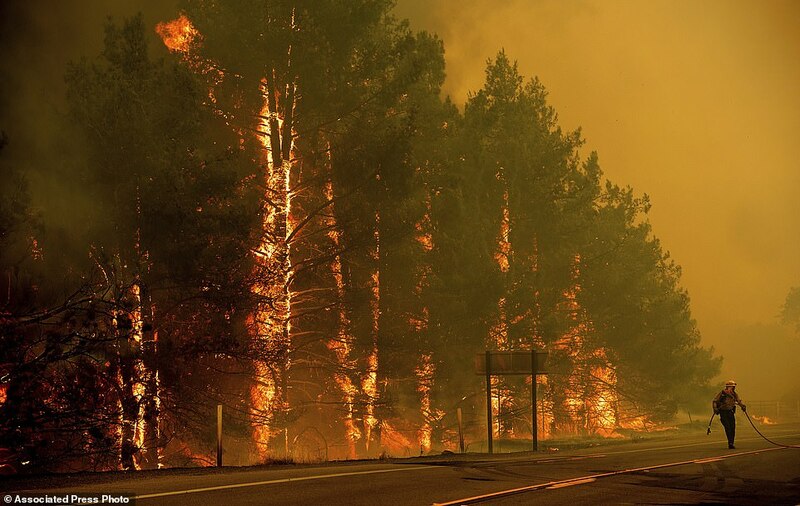 A wildfire burning in hot and dry conditions in Utah has forced the evacuations of a handful of seasonal cabins near a popular fishing reservoir. Jason Curry of the Utah Division of Forest, Fire and State Lands said Monday that the fire has scorched about 10 square miles near Strawberry Reservoir. Curry says the blaze about 80 miles southeast of Salt Lake City started Sunday and officials believe it was human-caused but are investigating. The fire is threatening about seven to 10 cabins that are used as seasonal homes, not primary residences. 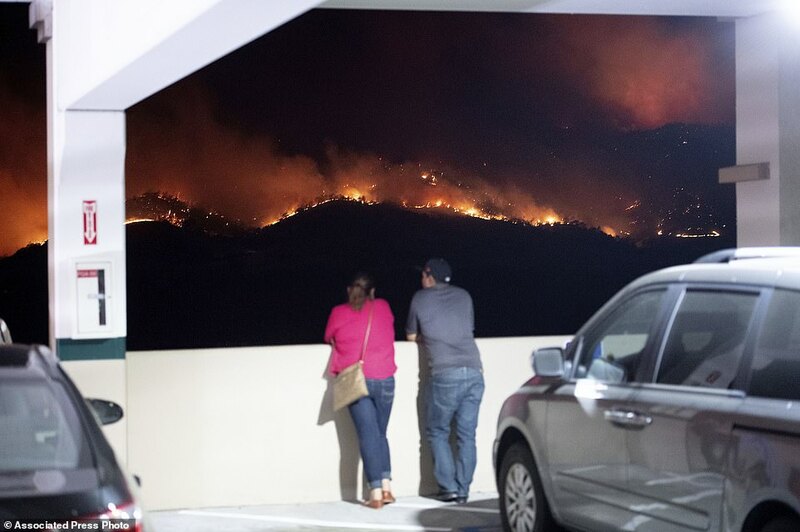 He says the fire is expected to grow with hot and dry conditions forecast for Monday. 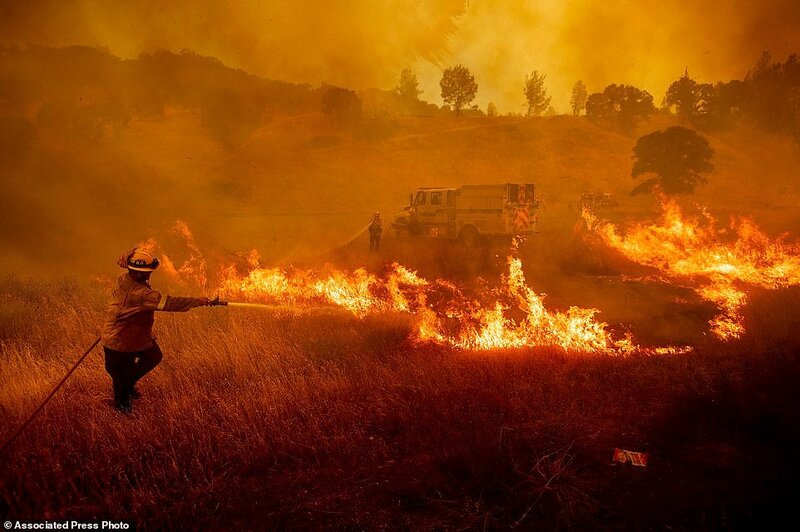 The California wildfire season was dramatic in California last year. What about 2018?